Some 300 Palestinian Arabs, accompanied by Israeli leftist activists, set up an outpost near Jericho on Friday, AFP reported. 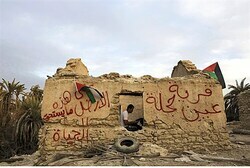 According to the report, the Arabs and leftists took over around a dozen abandoned houses. The protest, they said, was aimed at denouncing the repeated refusal of Prime Minister Binyamin Netanyahu to evict Jewish communities and agree to a pullout from the Jordan Valley. The protesters arrived by bus and car and paraded a banner proclaiming “No peace with settlements”, signed by the Youth Against Settlements group, reported AFP. They brought generators with them, indicating that they plan to at least stay overnight. Israeli police and soldiers deployed in the area, but made no immediate move to disperse the protest, the report said. In March of last year, Palestinian Arabs set up an illegal outpost in the E1 area, which connects between Jerusalem and Maaleh Adumim, as U.S. President Barack Obama visited Israel. Israeli police drove them out after several days of protest. The latest protest comes as peace talks between Israel and the Palestinian Authority (PA) continue, and amid reports that Secretary of State John Kerry is planning to present a framework for negotiations very soon. Some reports have indicated that Kerry’s proposal would involve a slow transition from IDF patrols over the Jordan Valley to PA forces, with an international presence. Israeli experts have warned that the area is strategically critical.